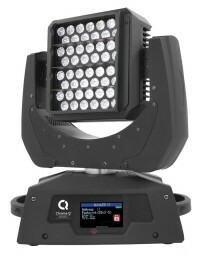 Utilising the same core technologies as the innovative Chroma-Q Studio Force D XT 12, the new AutoLED II is a 6,500K* CCT daylight white LED moving head fixture that boasts an extreme 16,430 hot lumens output for ultra bright, long distance throw; an optional revolutionary beam shaper that enables you to vary the beam angle, a built in louver to avoid glare, a high CRI and a smooth linear dimming curve. Utilising the very latest generation of LEDs and optics, the AutoLED II offers an ultra bright output of 16,430 lumens - providing precise daylight illumination for a wide range of event lighting applications including key-lighting, uplighting, backlighting, wash applications and effects. Including 16-bit pan and tilt movement, the AutoLED II allows you to fine-tune your beam placement via DMX control for extremely accurate positioning - saving you the time and manpower needed to manually focus conventional discharge fixtures. The AutoLED II comes supplied with a louver accessory. A revolutionary beam shaper lens plate - custom developed by Chroma-Q for remote control of beam angle adjustment – is also available as an optional accessory.